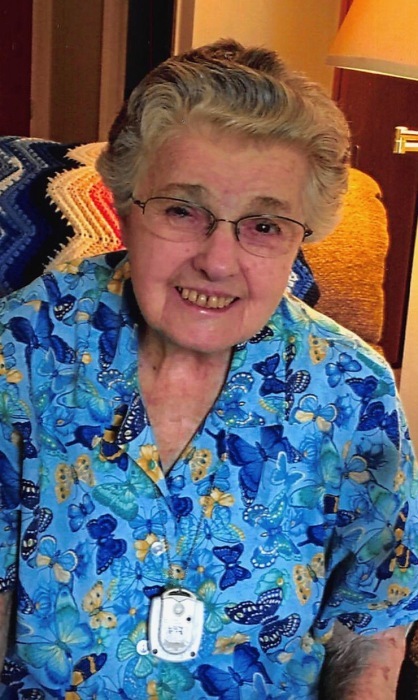 Margaret M. Leahy, 91, of Lake Geneva, WI, passed away Friday March 29, 2019 at Artisan Assisted Living. The former Margaret Mary Graef was born in Chicago, IL on September 5, 1927 the daughter of the late Henry and Magdalen (Elenz) Graef. On January 24, 1948 in Chicago, IL she was united in marriage to John T. Leahy: he preceded her in death on March 27, 2007. She was a member of Saint Francis deSales Catholic Church in Lake Geneva. She enjoyed the outdoors and spending time with her family. Margaret is survived by: 3 children; Michael (Dr. Jess) Leahy of Sioux Narrows, Ontario, Canada, Patrick (Carol) Leahy of Joliet, IL and Mary Margaret (Randy) Haggermaker of Anderson, AL, 11 grandchildren, 8 great-grandchildren, 3 great-great-grandchildren, and many nieces and nephews. She was preceded in death by: a son Thomas Leahy, a daughter Kathleen Luxem and 2 brothers Robert and Henry Graef. Mass of Christian Burial will be celebrated on Saturday April 6, 2019 at 12:30 p.m. at Saint Francis deSales Catholic Church in Lake Geneva; Father Mark Danczyk will officiate. Burial will be in Southern Wisconsin Veterans Memorial Cemetery in Union Grove, WI. Visitation will be Saturday from 10:00 a.m. until 12:00 p.m. at Derrick Funeral Home. In lieu of other expressions of sympathy memorials are requested in Margaret’s name to: the Alzheimer’s Association. To sign the on-line guest registry click Guest Book.